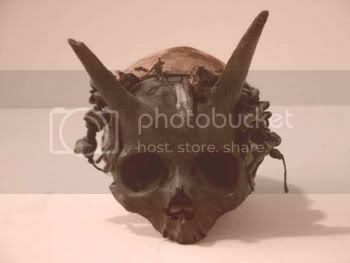 Several human skulls with horns protruding from them were discovered in a burial mound at Sayre, Bradford County, Pennsylvania, in the 1880's. With the exception of the boney projections located about two inches above the eyebrows, the men whom these skeletons belonged to were anatomically normal, though at seven feet tall they were giants. It was estimated that the bodies had been buried around A.D. 1200. The find was made by a reputable group of antiquarians, including the Pennsylvania state historian and dignitary of the Presbyterian Church (Dr. G.P. Donehoo) and two professors, A.B. Skinner, of the American Investigating Museum, and W.K.Morehead, of Phillips Academy, Andover, Massachusetts. The bones were sent to the American Investigating Museum in Philadelphia, where like so many finds that question anthropology, they were stolen and never seen again. In his book, The Natural and Aboriginal History of Tennessee, author John Haywood describes "very large" bones in stone graves found in Williamson County, Tennessee, in 1821. In White County, Tennessee, an "ancient fortification" contained skeletons of gigantic stature averaging at least 7 feet in length. A six foot, six inch skeleton was found in a Utah mound. This was at least a foot taller than the average Indian height in the area, and these natives – what few there were of them – were not mound builders. In February and June of 1931, large skeletons were found in the Humboldt lake bed near Lovelock, Nevada. The first of these two skeletons found measured 8 1/2 feet tall and appeared to have been wrapped in a gum-covered fabric similar to the Egyptian manner. The second skeleton was almost 10 feet long. (Review – Miner, June 19, 1931). There was a race or group of people found in Australia called "meganthropus" by anthropologists. These people were of very large size – estimated between 7 to 12 feet tall, depending on what source you read. These people were found with mega tool artifacts, so their humanness is difficult to question. Four jaw fragments and thousands of teeth have been found in China of "gigantopithecus blacki" – named after the discover. Based on the size of the teeth and deep jaws, its size has been estimated at around 10 feet and as tall as 12 feet, 1200 pounds.